Sue Peppe is the originator of the PEPS-C test. For how the test was developed and how to obtain it, see various PEPS-C pages on this site. I live in Dumfriesshire, Scotland. 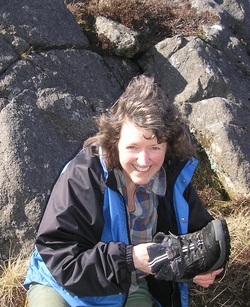 Until 2010 I was Research Fellow at Queen Margaret University, Edinburgh, Scotland. I have specialised for 25 years in the assessment of prosody and intonation in communication disorders. Following a BA in French and English at Bristol University, I completed an MA in Modern English Language at University College, London. I spent several years working there on intonation in the Survey of English Usage with Randolph Quirk and others. I then devised the PEPS procedure (‘Profiling Elements of Prosodic Systems' - PEPS) with Jane Maxim and Bill Wells, and used the test to gather data for my PhD thesis (doctorate in Speech Sciences in 1998). The test was reworked with children in mind as PEPS-C ('Profiling Elements of Prosodic Systems - Children'), and was used to collect data from typically-developing and language-impaired children. On moving to Scotland and Queen Margaret University, Edinburgh, I worked with (principally) Joanne Cleland (née McCann), Alan Wrench, Fiona Gibbon and my husband Gavin King-Smith to computerise the test and make it suitable for both adults and children ('Profiling Elements of Prosody in Speech-Communication'), and to undertake research into the prosody of children with high-functioning autism spectrum conditions, frequently presented at conferences. For a complete list of publications I have authored or co-authored on research into prosody and the assessment of prosodic skills see Peppe publications. I retired from paid employment in 2010. Currently my main occupation is distributing and continuing to develop the PEPS-C test, adding and modifying tasks and helping with the development of versions in languages other than English. I am also interested in the prosody of people with English as a second language. I act as consultant on prosody projects, particularly those concerning atypical prosody. I am currently engaged as a consultant on a project in the Department of Speech and Hearing Sciences at University College Cork, Ireland, investigating prosody in children with spina bifida. I have done a lot of choral singing (English Chamber Choir 20 years, Balliol Consort 10 years, Glasgow Chamber Choir 11 years, Wordsworth Singers since 2011) and I am very interested in pronunciation for singing. This brings together my singing experience, my training in phonetics and speech-prosody, my interest in historical phonetics, and my knowledge of how to speak several foreign languages.